So Christmas is over, you wrapped all the presents, decked the halls, cooked the food, and now you’re relaxing in that delicious post-Christmas haze of well-being. Then someone you really should have got a gift for drops by. What do you do? Why, just wrap the cat! Here’s how…. Looking for a super quick Halloween treat? Mini Grasshopper pies are the answer! Things to know: you need to use foil cupcake liners in this recipe, as paper ones will go soggy from the moisture in the pies. 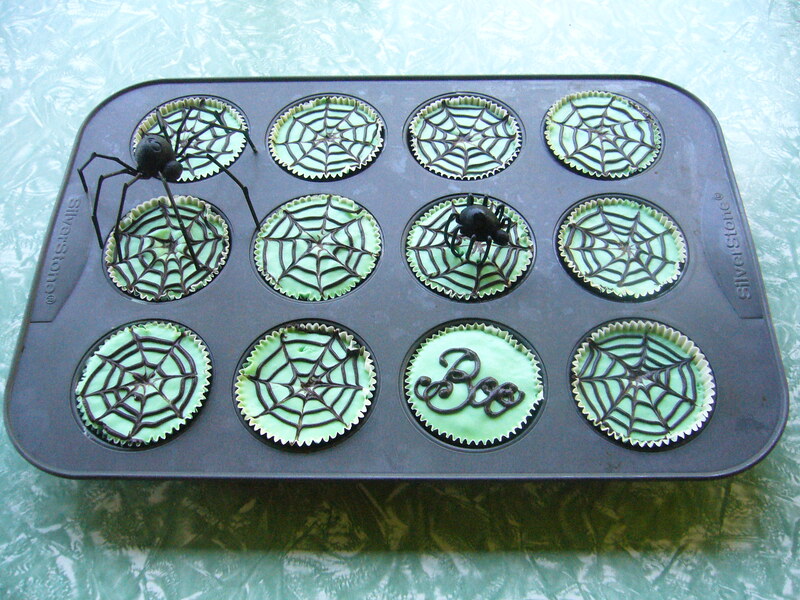 We used black ones for Halloween, but if you’re making these for another occasion, silver or green would look pretty. American readers can use half and half in place of the first measure of cream and milk. Line 16 muffin tray cups with foil liners, and place a Oreo into each cup as the pie base. Put the marshmallows, the 1/2 cup of cream and the milk into a medium saucepan, and heat on low, stirring constantly, until the marshmallows are completely melted. Stir in the two liquors, and put aside to cool. You can speed this up by standing the pan in a sink of cold water. When the marshmallow mix is no longer hot to touch, whip the remaining cream to soft peaks, pour in the marshmallow mix, add optional green colouring, and whip again briefly until the cream and marshmallow are combined. Pour into the foil cups and rap lightly on the bench to level. Put the chocolate into a disposable piping bag, or a small ziplock bag, and melt in the microwave in ten-second bursts, massaging the bag to help melt the chocolate evenly. Snip a small hole at the tip of the bag, (or the corner of the ziplock) and pipe a spiral of chocolate from the centre to the edge of a pie, and use a toothpick to drag the chocolate from the centre to the edge of the pie for web lines. Don’t try to pipe all the pies and then drag, as the chocolate sets too quickly to do this. Freeze for two to three hours until firm. Garnish with plastic spiders or flies! 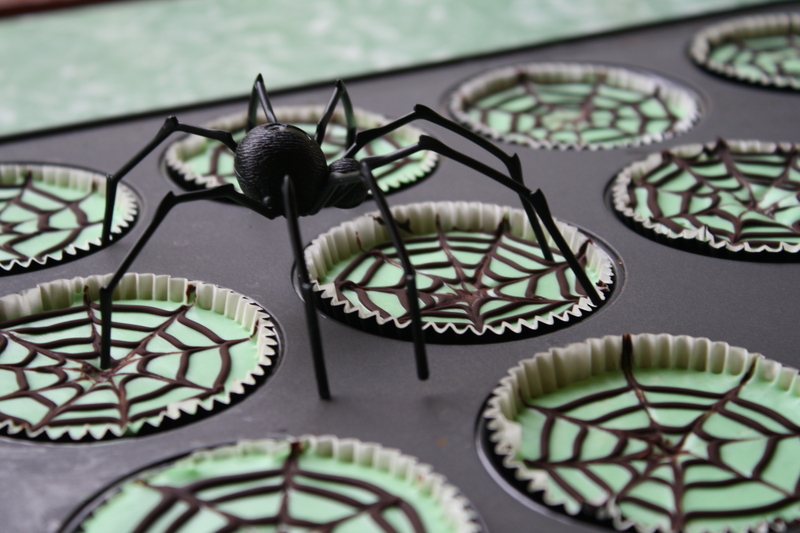 These would also be lovely for a summer dessert, with its cool minty flavour, in which case I’d replace the spider web with chocolate shavings. The recipe is easily doubled if you’re serving a crowd, although you’ll need a large bowl to whip the cream in. 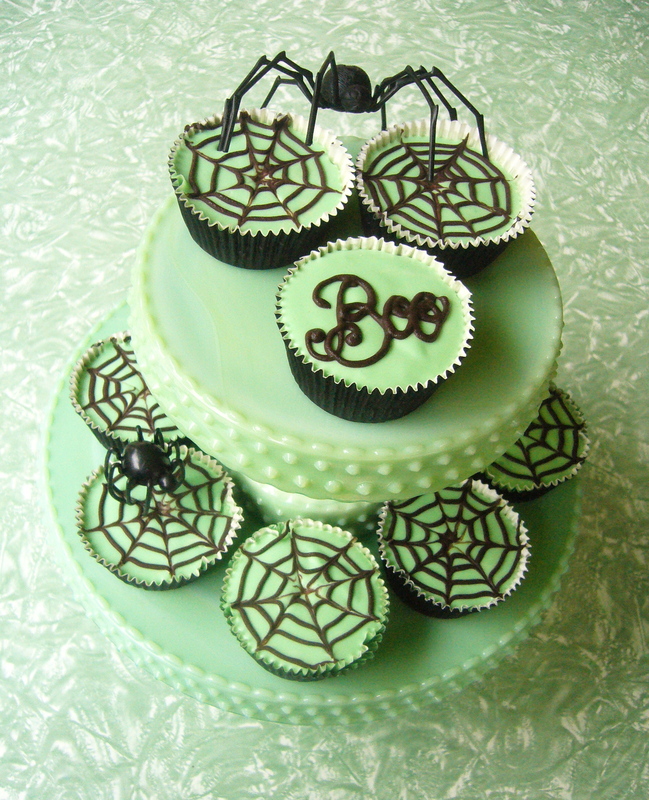 Happy and tasty Halloween, Dear Readers. Cheers from Karen. 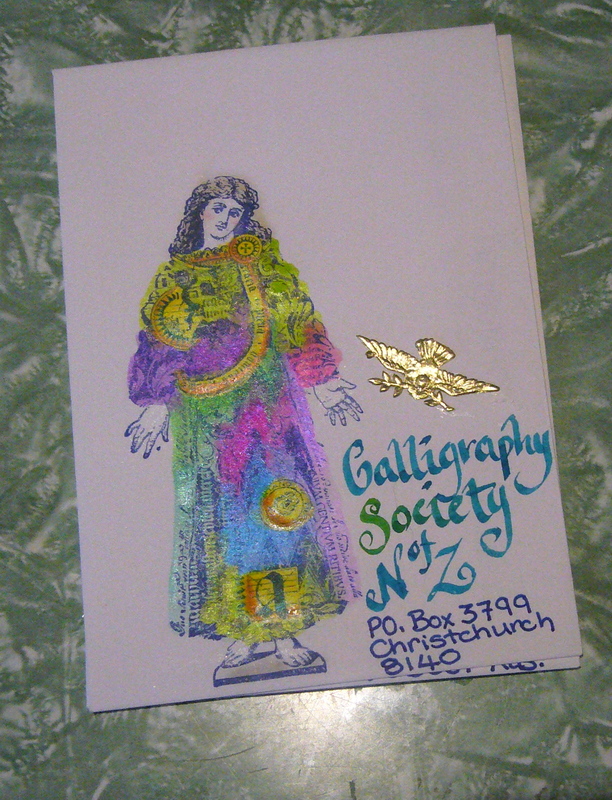 I belong to a calligraphy group that sends out its newsletter in hand lettered envelopes. 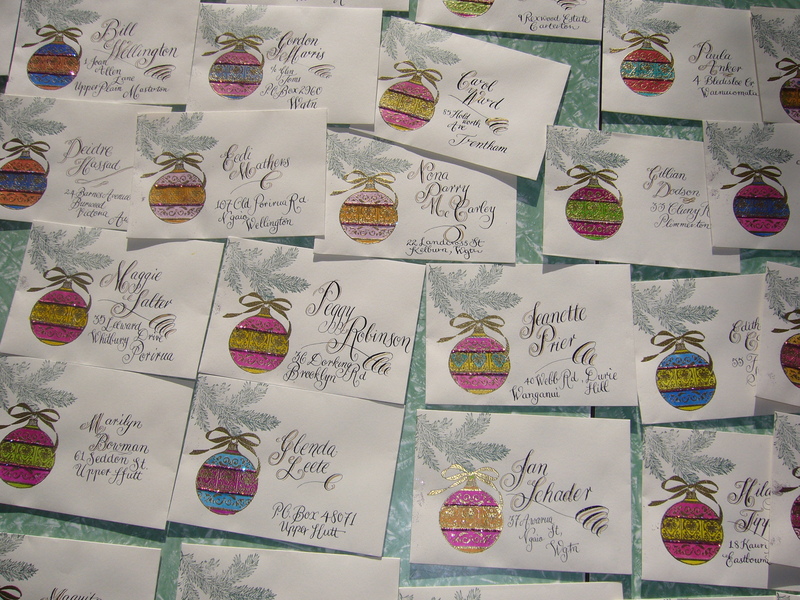 Members of the club take turns to do them, and as my calligraphy is not of the finest calibre, I like to do the Christmas ones, where I can compensate for my mediocre penmanship with lavish decorating. As you can see I tend to work in a rats nest of art supplies. The envelopes were firstly stamped with an image by Acey Deucy “Illuminata II”, in midnight blue Brilliance ink. Then watercoloured with Twinkling H2o’s. These are watercolours with a lovely mica shimmer in them. I used pastels to finish the face and hands for a softer effect. The lettering was done with a parallel plate pen, loaded with a light blue ink cartridge. To get the blended look, I occasionally touched the nib with another pen that had green ink in it. 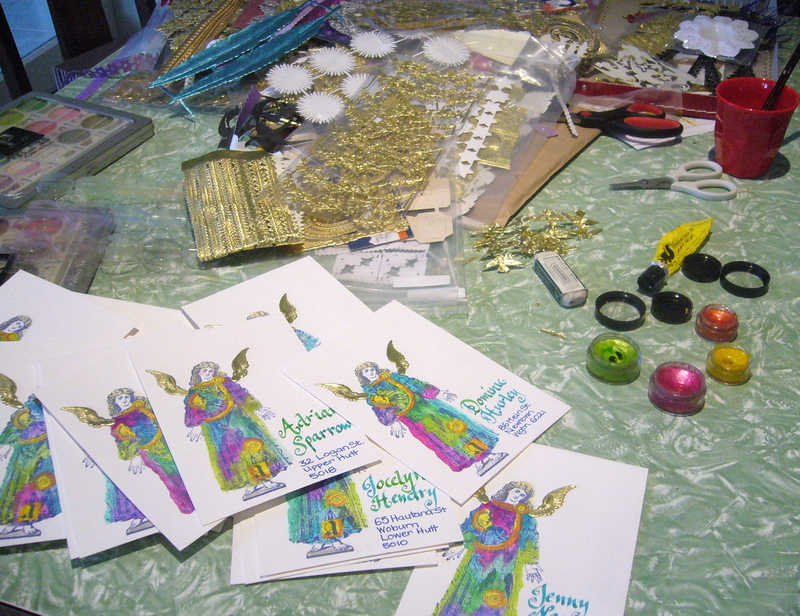 The final touch was to add a Dresden foil trim (I used angel wings on most of the envelopes, but when I ran out I switched to little doves.) I adore Dresden foil, and stockpile it whenever I’m in San Francisco. There is a store in Berkeley, The Castle in the Air, that has the most astonishing array of Dresden foils, along with more amazing craft supplies than you would expect under one roof. Each posting of the newsletter requires about forty four envelopes, so it’s a great opportunity to acquire some much-needed practice. I’ll show you the ones I did for last year, and maybe you can judge whether my lettering has improved or deteriorated! Thanks so much for stopping by, cheers Karen. My mind moves in extremely lateral zig-zags at times. 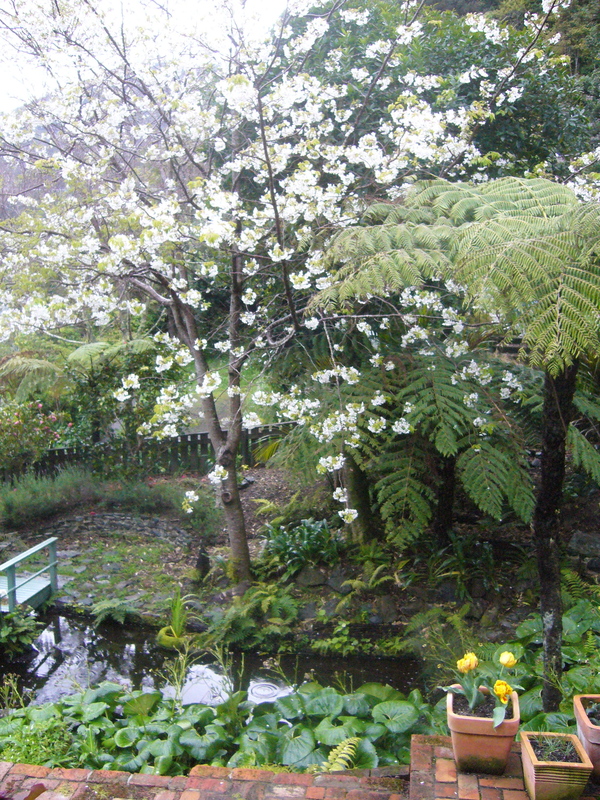 I was contemplating the beautiful spectacle of the flowering cherry tree in my garden, with its white blossoms drifting onto the surface of the pond, and rather than a haiku springing forth, I immediately decided that I needed to make a cherry pound cake. 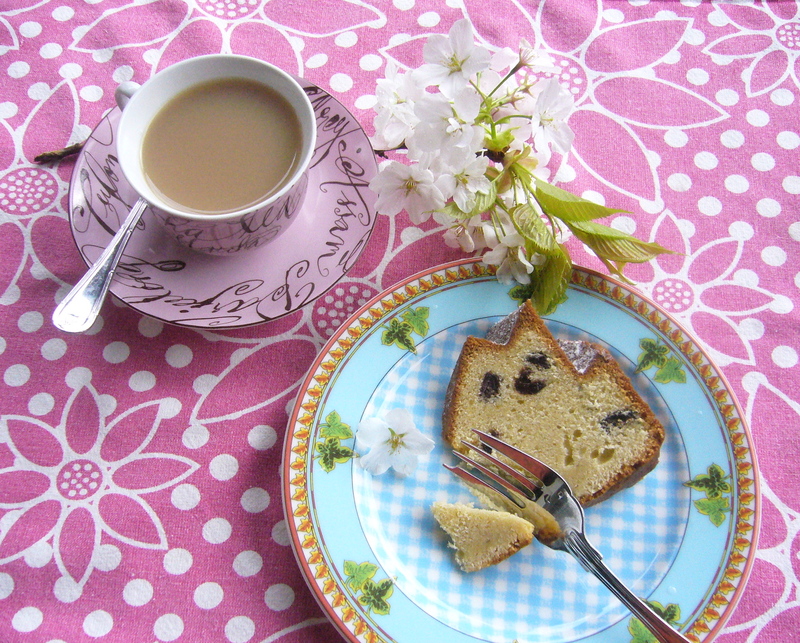 This pound cake recipe, with its buttery crumb, and delicious nuggets of kirsch-soaked cherries, comes from one of my most-used baking books, “The Cake Book” by Tish Boyle. I have hundreds of cookbooks; some for reference, some for gastroporn, with their titillating pictures of gourmet fantasies, some for that moment when I have to have Indian, or Thai or Russian food. And then there are the ones that are my kitchen workhorses. The books I turn to when I want to make something and be assured that the recipes will always work, and the results will always be worth the effort. The Cake Book is right there in the Top Ten amongst my baking books.